devices for infants and patients not able to cooperate with the clinician (e.g. those with additional disabilities or advanced cognitive decline). In the current environment, clinicians are faced with prescription of electroacoustic stimulation for their clients, provided either through a cochlear implant and hearing aid used in opposite ears (the bimodal solution) and/or a cochlear implant and hearing aid used together in the same ear (the hybrid solution). A key question being addressed is – how should these devices be fitted to the same or opposite ears to best suit individual users? Another element of the project is investigating how functioning of hearing aids can be adjusted over time to best complement differing cognitive and hearing abilities of their users as they age. Further it is looking at how directional characteristics of microphones can be best adjusted for different users and different listening situations. This project will address how should the functioning of a hearing aid be adjusted over time to best complement the differing cognitive and hearing abilities of their users. The project will determine how the directional characteristics of microphone arrays can be adjusted for different hearing aid wearers and in different listening situations to provide an improved listening experience. This project will look at how cochlear implants can be efficiently fitted to infants and elderly patients who are not able to provide clinicians with reliable behavioural responses to stimulation. 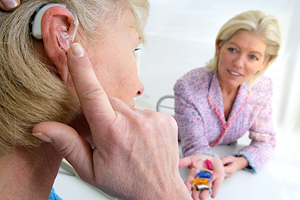 The project examines how hearing aids and cochlear implants fitted to the same or opposite ears can be adjusted to best complement each other for an individual. This project will consider how hearing aids and cochlear implants should be fitted to children with Auditory Neuropathy Spectrum Disorder (ANSD) to best effect.